Victoria Bowling Club » Well done Rich, Brad & Ray! You are here: Home » Blog » Competitions » Well done Rich, Brad & Ray! 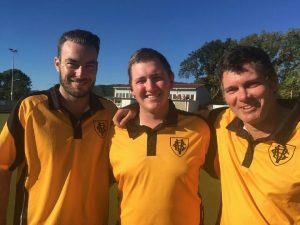 Congratulations to Richard Corry, Bradley Down and Ray Martin defending their Wellington Open Triples title from last season. The tournament was rain affected stretching over three different weekends with the mens final arranged at short notice when an opportunity arose on Sunday. The Victoria triple were too strong for Mike Solomon’s Eastbourne triple winning 19-11. The title was the 7th for Rich, and 5th each for Brad and Ray handing them their Wellington Gold Stars.